A lot of times, people tell me that the reason they don’t want to use cloth diapers is because they will have to rinse any solids out of the diapers and into the toilets. Images of the “olden days” come to mind with a mama bent over a toilet, swirling a prefold in the water and attempting to shake out any clumps before she rings it out and puts it into a 5-gallon bucket with a stash of other diapers who suffered the same procedure. Gone are those days! 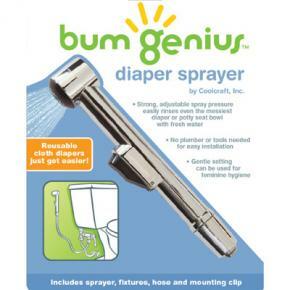 Before our daughter was born, my husband and I invested our money in a bumGenius! Diaper Sprayer (DS). Similar to a personal bidet, the DS easily attaches to the side of one’s toilet, allowing the water source to be easily turned on or off by the lifting of a handle. This has been a life saver to us, allowing us to quickly, cleanly, and efficiently rinse our cloth diapers before placing them in our pail. No more yuckies! The list price of this product is around $45.00. We found this to be true in store and online, and also for other similar products. Though this may be more expensive initially than many would care for, let me assure you that is and investment worthy of your money. Overall, I give this product 4.5 out of 5 stars. – Easy to install and doesn’t require any additional parts. – The water power is strong enough to remove all solids including those that are “seeped” into the fabric. In fact, you need to be careful to hang on to your diaper so that it doesn’t end up being sprayed itself into the toilet. – Very easy to use—even my mother in law uses it! – No more bending over, getting your hands wet, or wasting precious time to remove solids from diapers. – It’s small and barely noticeable on the side of our toilet. – After the initial installation, we had a small leak where everything connected to the toilet. I think it was a placement issue as it has since spontaneously resolved. – You must lower the handle that allows the water source to connect to the DS after you’re done using it. The pressure of the water can build up and cause toilet damage over time. We weren’t lowering it at first, and whola, we had to replace part of the toilet mechanism as a result. Since then, we lower it every time (shutting off the water supply to the DS) and have had no problems.